^ a b "Council Regulation (EU) No 1259/2010 of 20 December 2010 implementing enhanced cooperation in the area of the law applicable to divorce and legal separation". Official Journal of the European Union. 29 December 2010. Retrieved 2012-04-14. ^ a b "Regulation 1257/2012". Official Journal of the European Union. L 361/1. 31 December 2012. Retrieved 2013-02-09. ^ a b "Council Regulation 1260/2012". Official Journal of the European Union. L 361/89. 31 December 2012. Retrieved 2013-02-09. ^ "Three more EU Member States back cross-border divorce law pact – EUbusiness – legal, business and economic news from Europe and the EU". Eubusiness.com. 28 May 2010. Retrieved 2011-12-13. ^ a b Pop, Valentina. "Twelve EU states inch closer to common divorce rules". Euobserver.com. Retrieved 2011-12-13. ^ "European nations seal divorce law pact – EUbusiness – legal, business and economic news from Europe and the EU". Eubusiness.com. Retrieved 2011-12-13. ^ "Council Decision of 12 July 2010 authorising enhanced cooperation in the area of the law applicable to divorce and legal separation". Official Journal of the European Union. 22 July 2010. Retrieved 2012-04-14. ^ a b "Commission Decision of 21 November 2012 confirming the participation of Lithuania in enhanced cooperation in the area of the law applicable to divorce and legal separation (2012/714/EU)". Official Journal of the European Union. 22 November 2012. Retrieved 2012-11-22. ^ "Greece is Member State No. 16 to sign up to EU rules helping international couples". European Commission. 2014-01-27. Retrieved 2014-01-29. ^ "Commission Decision of 27 January 2014 confirming the participation of Greece in enhanced cooperation in the area of the law applicable to divorce and legal separation". Official Journal of the European Union. 2014-01-27. Retrieved 2014-01-29. ^ "Estonia is the 17th Member State to participate in EU regulation supporting international couples". European Commission. 2016-08-11. Retrieved 2016-08-11. ^ "COMMISSION DECISION (EU) 2016/1366 of 10 August 2016 confirming the participation of Estonia in enhanced cooperation in the area of the law applicable to divorce and legal separation". Official Journal of the European Union. L 216/23. 2016-08-11. Retrieved 2016-08-11. ^ "Council authorises Enhanced Co-operation for EU-Patent" (PDF). Retrieved 2011-12-13. ^ a b c d e "Signing of the Unified Patent Court agreement" (PDF). Council of the European Union. 19 February 2013. Retrieved 2013-02-19. ^ a b "Unitary patent – ratification progress". European Commission. Retrieved 2013-02-19. ^ a b "Will Poland join the Unitary Patent system?". World Intellectual Property Review. 5 February 2013. Retrieved 2013-02-09. ^ a b "Background note – Competitiveness Council – Brussels, 18 and 19 February 2013" (PDF). Court of Justice of the European Union. 11 February 2013. Retrieved 2013-02-11. ^ "COUNCIL DECISION (EU) 2016/954 of 9 June 2016 authorising enhanced cooperation in the area of jurisdiction, applicable law and the recognition and enforcement of decisions on the property regimes of international couples, covering both matters of matrimonial property regimes and the property consequences of registered partnerships". Official Journal of the European Union. L 159/16. 2016-06-16. Retrieved 2016-07-05. ^ "Council Regulation (EU) 2016/1103 of 24 June 2016 implementing enhanced cooperation in the area of jurisdiction, applicable law and the recognition and nforcement of decisions in matters of matrimonial property regimes". Official Journal of the European Union. L 159/16. 2016-06-24. Retrieved 2016-09-03. ^ "Council Regulation (EU) 2016/1104 of 24 June 2016 implementing enhanced cooperation in the area of jurisdiction, applicable law and the recognition and enforcement of decisions in matters of the property consequences of registered partnerships". Official Journal of the European Union. L 183/16. 2016-06-24. Retrieved 2016-09-03. ^ "European public prosecutor's office : 16 member states together to fight fraud against the EU budget". Council of the European Union. 2017-04-03. Retrieved 2017-10-21. ^ "20 member states agree on details on creating the European Public Prosecutor's office (EPPO) - Consilium". www.consilium.europa.eu. Retrieved 2017-06-11. ^ a b "Council Regulation (EU) 2017/1939 of 12 October 2017 implementing enhanced cooperation on the establishment of the European Public Prosecutor's Office ('the EPPO')". Official Journal of the European Union. L 283/1. 2017-10-31. Retrieved 2017-10-31. ^ "20 member states confirm the creation of an European Public Prosecutor's Office". Council of the European Union. 2017-10-12. Retrieved 2017-10-21. ^ "European Public Prosecutor's Office - update on the implementation". Council of the European Union. 2018-05-30. Retrieved 2018-06-12. ^ "OUTCOME OF THE COUNCIL MEETING - 3622nd Council meeting - Justice and Home Affairs" (PDF). Council of the European Union. 2018-06-05. Retrieved 2018-06-09. ^ "European Public Prosecutor's Office: The Netherlands becomes 21st country to join common efforts to protect EU budget against fraud". European Commission. 2018-08-01. Retrieved 2018-08-02. ^ "PRESS RELEASE BY THE MINISTRY FOR JUSTICE, CULTURE AND LOCAL GOVERNMENT: Malta joins the European Public Prosecutor's Office". Government of Malta. 2018-06-14. Retrieved 2018-06-15. ^ "European Commission - Daily News". European Commission. 2018-08-07. Retrieved 2018-08-08. ^ "COMMISSION DECISION (EU) 2018/1103 of 7 August 2018 confirming the participation of Malta in the enhanced cooperation on the establishment of the European Public Prosecutor's Office". Official Journal of the European Union. 2018-08-07. Retrieved 2018-08-07. ^ Carsten Volkery (13 March 2012). "Euro Zone Split over Financial Transaction Tax". Der Spiegel. Retrieved 2012-09-20. ^ "Parliament approves transaction tax". The Budapest Times. 17 July 2012. Retrieved 2012-09-20. ^ "Commission proposes green light for enhanced cooperation on financial transactions tax". European Commission. 23 October 2012. Retrieved 2012-12-27. ^ "11 eurozone states ready to launch financial transactions tax: EU tax commissioner". The Economic Times. 9 October 2012. Retrieved 2012-10-09. ^ "Eleven EU countries get Parliament's all clear for a financial transaction tax". European Parliament. 12 December 2012. Retrieved 2012-12-27. ^ a b "Financial Transaction Tax under Enhanced Cooperation: Commission sets out the details". European Commission. 14 February 2013. Retrieved 2013-02-14. ^ "Commissioner Šemeta welcomes European Parliament vote on Financial Transactions Tax". European Commission. 2013-07-03. Retrieved 2013-07-27. ^ "Financial transaction tax: clearing the next hurdle". European Parliament. 11 December 2012. Retrieved 2012-12-27. ^ "Enhanced cooperation in the area of Financial Transaction Tax − Proposal for a Council Directive implementing enhanced cooperation in the area of Financial Transaction Tax = State of play". Council of the European Union. 2016-06-03. Retrieved 2016-07-05. ^ Banila, Nicoleta (2017-10-17). "Romania to join EU's defence initiative PESCO". SeeNews. Archived from the original on 2017-10-18. Retrieved 2017-12-07. ^ "EU defence ministers: defence cooperation needs to be brought to a new level". Estonian Presidency of the Council of the European Union. 2017-09-07. Archived from the original on 2017-10-18. Retrieved 2017-12-07. ^ "Permanent Structured Cooperation on defence could be launched by end 2017". European External Action Service. 2017-09-08. Archived from the original on 2017-09-12. Retrieved 2017-12-07. ^ "Czech government to join PESCO defence project". Prague Daily Monitor. 2017-10-12. Archived from the original on 2017-10-12. Retrieved 2017-12-07. ^ "Permanent Structured Cooperation (PESCO) - Council Decision - preparation for the adoption". Council of the European Union. 2017-12-08. Retrieved 2017-12-12. ^ "PESCO: EU paves way to defense union". Deutsche Welle. 2017-11-13. Archived from the original on 2017-11-18. Retrieved 2017-11-16. ^ Erlanger, Steven (2017-11-13). "E.U. Moves Closer to a Joint Military Force". The New York Times. ISSN 0362-4331. Archived from the original on 2017-11-13. Retrieved 2017-11-13. ^ "Malta among three countries opting out of EU's new defence agreement". Times of Malta. 2017-12-11. Archived from the original on 2017-12-12. Retrieved 2017-12-12. ^ "Twenty-five EU states sign PESCO defense pact". Deutsche Welle. 2017-12-11. Archived from the original on 2017-12-12. Retrieved 2017-12-12. ^ "25 March 2011 Council decisions" (PDF). Retrieved 2011-12-13. ^ "Convention on jurisdiction and the enforcement of judgements in civil and commercial matters". Council of the European Union. Retrieved 2014-11-06. ^ "COUNCIL REGULATION (EC) No 44/2001 of 22 December 2000 on jurisdiction and the recognition and enforcement of judgments in civil and commercial matters". Official Journal of the European Union. L (121). 2001-01-16. Retrieved 2014-11-07. ^ "Convention on the law applicable to contractual obligations". Council of the European Union. Retrieved 2014-11-06. ^ "REGULATION (EC) No 593/2008 OF THE EUROPEAN PARLIAMENT AND OF THE COUNCIL of 17 June 2008 on the law applicable to contractual obligations (Rome I)". Official Journal of the European Union. L (177). 2008-07-04. Retrieved 2014-11-07. ^ "Convention determining the State responsible for examining applications for asylum lodged in one of the Member States of the European Communities (Deposited with the Government of Ireland)". Council of the European Union. Retrieved 2014-11-08. ^ "COUNCIL REGULATION (EC) No 343/2003 of 18 February 2003 establishing the criteria and mechanisms for determining the Member State responsible for examining an asylum application lodged in one of the Member States by a third-country national". Official Journal of the European Union. L (50/1). 2003-02-25. Retrieved 2014-11-08. ^ "Convention drawn up on the basis of Article K.3 of Treaty on European Union, on the establishment of a European Police Office (Europol Convention)". Council of the European Union. Retrieved 2014-11-06. ^ "Europol (European Police Office)". European Union. Retrieved 2014-11-06. 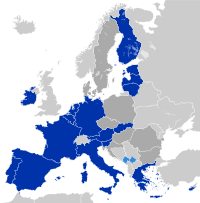 ^ "COUNCIL DECISION of 6 April 2009 establishing the European Police Office (Europol)". Official Journal of the European Union. L (121). 2009-05-15. Retrieved 2014-11-06. ^ "Latvia and the euro". European Commission. 2013-03-05. Retrieved 2013-03-31. ^ "Latvia Wins Final EU Approval to Adopt Euro on Jan. 1 Next Year". Bloomberg. 2013-07-09. Retrieved 2013-07-09. ^ "Commission: Latvia meets the conditions for adopting the euro". European Commission. 2013-06-05. Retrieved 2013-06-16. ^ "Latvia to join the ESM on 13 March 2014". European Stability Mechanism. Retrieved 2014-03-03. ^ "a136 Amendment details". Retrieved 2013-04-23. ^ "Latvia becomes the 18th Member State to adopt the euro". European Commission. 2013-12-31. Retrieved 2013-12-31. ^ "The draft agreement on the creation of a European and Community Patent Court is not compatible with European Union law" (PDF). Court of Justice of the European Union. 8 March 2011. Retrieved 2013-02-08. ^ "The long road to unitary patent protection in Europe" (PDF). Council of the European Union. 17 December 2012. Retrieved 2013-02-08. ^ "Agreement on a Unified Patent Court" (PDF). 16351/12. Council of the European Union. 11 January 2013. Retrieved 2013-02-11. ^ Wishart, Ian (14 February 2013). "Countries to sign up to unitary patent system". Retrieved 2013-02-19. ^ "Council approves single supervisory mechanism for banking". Council of the European Union. 2013-10-15. Retrieved 2014-05-29. ^ a b c d e "Member states sign agreement on bank resolution fund" (PDF). European Commission. 2014-05-21. Retrieved 2014-05-30. ^ a b "A Single Resolution Mechanism for the Banking Union – frequently asked questions". European Commission. 2014-04-15. Retrieved 2014-05-29. ^ a b "Council agrees its position on the single resolution mechanism". Council of the European Union. 2013-12-19. Retrieved 2014-05-29. This page was last edited on 5 April 2019, at 23:48 (UTC).